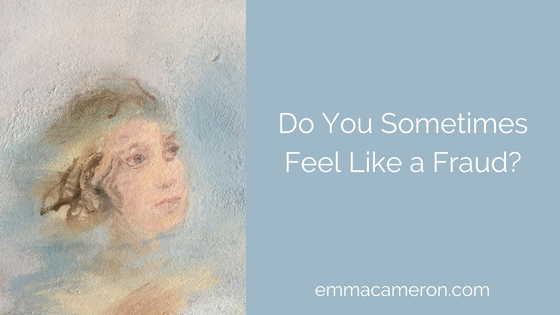 Do you sometimes feel like a fraud, worrying that you’re not good enough? When you feel like a fraud, it can be hard to get in touch with a grounded, realistic, ‘good enough’, authentic sense of yourself. But you’re not alone – it’s quite common. There’s even a name for it: Impostor Syndrome. As a sensitive, thoughtful person you may be particularly prone to feeling like a fraud at times. Let’s take a look at what impostor syndrome is, where it comes from, and what can help. The good news… and the even better news! The good news about impostor syndrome is that it’s pretty common, and many people know what it’s like to feel like a fraud in some way, at times. The even better news, is that it’s possible to lessen and diminish your impostor syndrome, so that you feel like a fraud much less often, and in a much milder version. Impostor syndrome can be helpful if it helps us keep an open mind and encourages us to seek out new ways of understanding and learning. It’s unhelpful, though, when we get so caught up in the shame, guilt and anxiety that can come along with impostor syndrome, that we get defensive and ‘shut down’ from reaching out and growing. Impostor syndrome has its roots in childhood and adolescence, when our brains and bodies are being built fastest. Groundbreaking British psychoanalyst Donald Winnicott described how as children we learn to hide our ‘true self’ (including our individual authentic forms of self-expression, and our needs, wants and preferences) so that we can fit in better with our family and culture. Winnicott suggested that we have to create a ‘false self’ which complies with what’s acceptable and allowed by those around us. When we feel like a fraud, suggested Winnicott, we may be experiencing a disconnect (or a poor fit) between our ‘false self’ and our ‘true self’. Psychologists Dr Pauline Clance and Suzanne Imes elaborated on this in 1978, and they coined the term ‘impostor syndrome’. There is complexity to Winnicott’s ideas of ‘true and false self’, and I’m not going to go into detail on the theory here. But let’s pick up on his idea that we all have a ‘public self’ and a ‘private self’ – and the more aligned these two are, the more whole and peaceful we may feel. If we feel that our ‘public self’ is in some way fake – an impostor – then we can feel deeply uneasy, worried and dissatisfied. We feel like a fraud, and it can be a deeply troubling private experience. Let’s take a look at two people’s experiences of how they felt like a fraud, and worked to expand and strengthen their resilience and authenticity. First we’ll look at Delia, and then Sally. Please note: Although I have based the following on my clinical experience, Delia and Sally are not actual clients, but fictional composites, created as examples. Delia felt very uneasy in her new role as head of the research department in a small biotech company. Even though she had lots of solid experience in the field, and her employers expressed confidence in her abilities, she began worrying that she didn’t have what it took to do the job. And the more Delia worried, the more fixed her thinking patterns became. She stopped interacting naturally with her colleagues, making excuses not to join them for lunch and at social events. Meetings became a dreaded event, and when Delia had to take part, she felt herself clam up. “My mind just went blank” Delia reported. “I felt I had completely run out of things to say. And I couldn’t really hear what other people were saying either, because I was so caught up in worrying about how stupid everyone must think I am”. Delia’s fear was starting to become a self-fulfilling prophesy. People might soon start to doubt her, because of what they observed of her behaviours. Delia and I worked together over time to help her soften the ‘feel like a fraud’ feelings. Our work together focused on several things. First, we worked on ways for her to feel safe enough with me, as her therapist. This was important preparation so that she’d become increasingly able to share some of her more vulnerable feelings without feeling traumatically exposed. We also worked on resourcing: helping Delia recognise her strengths. She learned ways to tap into these inner resources when she was feeling wobbly and self-critical. She started to notice some of the self-defeating patterns that were easier for her to change, and built in a few new coping strategies. Then we could move into more tender territory, and deepen into a sensitive and gentle exploration of some difficult experiences and relationships from her past (as well as the present) in a way that allowed both integration and grieving. As she worked through the layers of complicated feelings embedded in the impostor syndrome, Delia felt more genuinely free to let go of that pattern of thoughts and behaviours. She became more comfortable in her role at work, and socially too. Delia discovered that taking the risk of showing what she could (and couldn’t) do was really worth it. She found that people were more accepting of her limitations and idiosyncrasies than she’d expected them to be. And she got a whole lot better at accepting her own flaws and quirks too. “I feel like now, it’s okay just be me. And that means that sometimes I’ll have ideas to contribute in meetings, and sometimes I won’t. And I’m fine with that! It’s such a relief to not feel so anxious and inadequate all the time” she said, when we ended our work. “I always felt a bit of a fraud in my job” said Sally, who supervised a staff team at a hospice. “I rose up through the ranks in admin roles, and although I had a basic qualification, I didn’t really have the full, in-depth clinical training that the staff that I supervised had. They would talk about things I didn’t really have much clue about, and I always felt kind of out of my depth around them. Sally considered whether to embark on more training. In the end she decided against taking a further formal qualification, but instead to take more short CPD courses, and read more about the subject generally. Sally decided to enter into personal therapy. Through therapy, she could begin to experience the deep acceptance of all her qualities, in the safe healing space of a meaningful therapeutic relationship. Sally worked on becoming more open and transparent with the team she supervises, and instead of constantly trying to cover up her gaps in knowledge, she invited some of them to share aspects of their work with her in new ways. Therapy is one way of easing out of the grip of impostor syndrome. But self-help can go a long way, too, so you feel like less like a fraud. There are plenty of things we can do to help minimise the gap between our public persona and our inner felt sense of who we are. In another post, Impostor Syndrome: How to Release Yourself, I’ve outlined five ideas that you may find helpful in overcoming impostor syndrome. And if you’re a creative, sensitive, thoughtful person who is looking for a psychotherapist in Colchester, Essex or Suffolk, or online counselling, contact me to see whether I might be able to be of help. 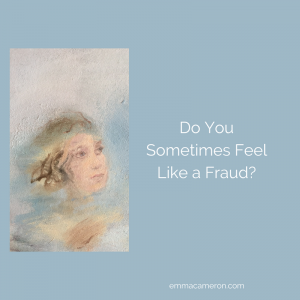 What helps you when you feel like a fraud? If you’re a creative sensitive person, what have you found helpful for dealing with impostor syndrome? Let us know in the comments below.